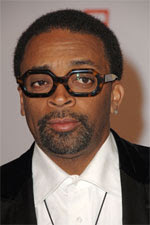 Spike Lee was honored recently by Chrysler LLC with their "Behind The Lens" distinction for outstanding achievements in Film and Television. With a body of work that includes over 35 films through Lee's 40 Acres & A Mule Filmworks, Lee is recognized as a leading director, producer, and screenplay writer in the entertainment industry. Lee's first feature film, "She's Gotta Have It", was shot in two weeks on a $175,000 budget. The film went on to gross $7 million dollars at the box office. Talk about amazing! In conjunction with award, the Chrysler Foundation donated $25,000 to Lee’s alma mater, Morehouse College, in the realm of Sports Journalism.